The school has no piped water. 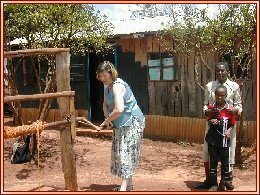 When Jean visited the school in July 2004, the major means of obtaining water was from a borehole in the school compound. Water levels were becoming lower, and the supply often dried up during the October to November dry season. Some rain water was collected, but it was difficult to store. In February 2005, we supplied funding for a plastic tank for storing rainwater, much of which had previously simply run away. We also funded a pump to help raise water from the underground tank to the plastic one at the surface.